In 1839 Mississippi governor Alexander McNutt encouraged the legislature to establish a state university to protect funds set aside for education from being depleted, provide a body of teachers and tutors, and educate Mississippi’s sons in their home state. Within two years legislators chose Oxford as the home of the school, and in 1844 the University of Mississippi was chartered. The board of trustees favored a classical curriculum focusing on ancient history, Greek, Latin, literature, philosophy, logic, and rhetoric. The first ten-month session began in 1848 with a president, three professors, and eighty students. Under the daily supervision of the faculty, students began and ended their days with communal prayers, participated in two literary societies, and formed several secret organizations, such as social fraternities and Greek-letter societies. Throughout the antebellum era, the college grew rapidly, adding new courses, professorial positions, and a chemistry lab, an astronomical observatory, and other scientific facilities. On 2 February 1861 Mississippi seceded from the Union, and after the attack on Fort Sumter the students enlisted to fight for the Confederacy, forcing the university to close its doors. Some students joined the University Greys, a military company of students, or the Lamar Rifles, a similar unit for Lafayette County; others returned to their home counties and joined units there. Both the Greys and Rifles became part of the 11th Mississippi Volunteer Infantry Regiment. The student soldiers participated in many of the war’s most significant encounters, including Harpers Ferry, the First Battle of Bull Run, and Gettysburg. With the end of the war, the board of trustees reconvened in July 1865 and appointed new faculty members and a chancellor. During the immediate postwar period, the university temporarily lowered admission standards to avoid rejecting veterans and kept costs down by eliminating tuition, allowing students to board in town, and permitting students to prepare meals in their rooms. By 1871 the University of Mississippi was a thriving liberal arts college with an elective curriculum, an undergraduate college, a School of Law and Governmental Science, and a College of Agriculture. In 1882 the university began to admit women, though they remained barred from the law school and from living on campus. In 1885 Sarah Isom became the university’s first female professor. Ninety years later, the Sarah Isom Center for Women’s Studies was named in her honor. 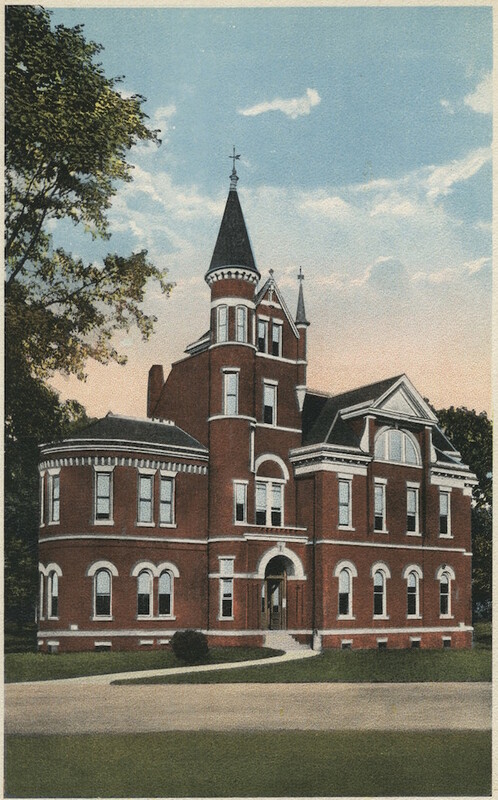 During the Gilded Age student culture incorporated Greek fraternities and athletics, and as enrollment grew, the campus changed, adding such modernizations as a water tower, a sewer system, and electricity. Chancellor Andrew Kincannon worked to counter the university’s elitist image through such reforms as the establishment of a student labor fund, a self-help bureau, a student honor system, and a student employment system. During World War II the university contributed to the war effort via the Accelerated Academic Program and offering a training course to military personnel. During this era, sports programs at the University of Mississippi as well as many other universities grew from small recreational programs to large and well-funded spectator sports. From the end of the war through the 1950s, the university increased enrollment, constructed new buildings, and expanded its medical program. Racial tensions intensified along with the civil rights movement. The university avoided the issue of integration until James Meredith began an effort to enroll in the early 1960s. In spite of massive resistance by the state, the university, and the board of trustees, the US Court of Appeals for the 5th District ordered his admission, and he arrived on campus in September 1962. With Gov. Ross Barnett continuing to insist that Mississippi’s schools would not integrate and the legislature attempting to find other ways to bar Meredith, a riot broke out on campus on the night of 30 September, and two people were killed. In response, the Kennedy administration nationalized the Mississippi National Guard and ordered federal troops to campus, and with the protection of federal marshals, Meredith enrolled on 1 October. Despite harassment, Meredith graduated from the University of Mississippi on 18 August 1963 with a major in political science and minors in French and history. The legacy of this violent opposition to desegregation haunted the image of the university for decades, but beginning in the 1970s, the university also experienced substantial growth and renewed its commitment to academic excellence. Taking advantage of its ties to William Faulkner, the university initiated the annual Faulkner and Yoknapatawpha Conference in 1974. The following year saw the inauguration of the Chancellor’s Symposium on Southern History, while the Center for the Study of Southern Culture was created in 1977 and Willie Morris became the school’s first writer in residence in 1980. University leaders, faculty, staff, and students continued to address controversies over issues involving Confederate imagery, especially at sporting events. Since 1983 the university has worked to dissociate itself from the Confederate flag, an effort that has had increasing success. Robert Khayat, who served as the school’s chancellor from 1995 to 2009, set a goal of making the University of Mississippi “a great public university,” and to that end, the school has added an honors college and new programs in accountancy, physical acoustics, international studies, and journalism. By the second decade of the twenty-first century, enrollment topped twenty-three thousand. Written by Mary Clingerman Yaran, Washington, D.C.